It was time to find our Christmas tree. Because Lihn's cage is where we normally set up the tree, we decided to put the tree in front of the window instead. 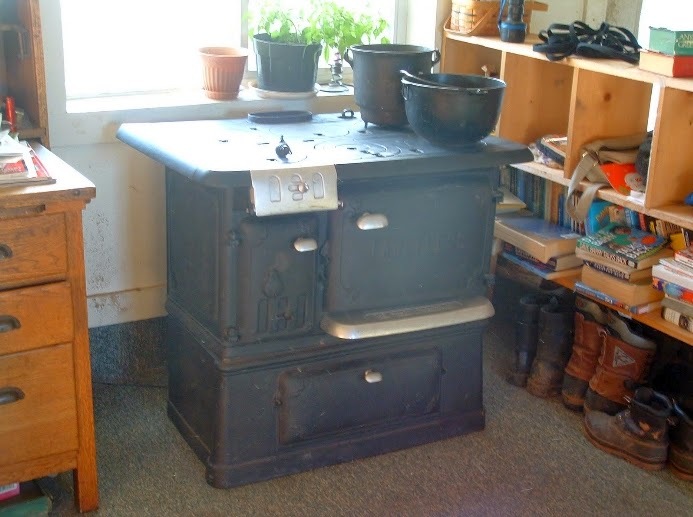 But to do this, we needed to disassemble the cookstove which has occupied that spot for several years. This stove is missing some critical components we need to get custom-manufactured before the stove can be used, so for all that time it's just been taking up space. So we took it apart and stored it in the barn for the time being. This left a very dirty spot that needed some serious cleaning. Since we have plans for this spot after Christmas is over, we decided to modify the boot unit as well. We disassembled the bookshelf portion and moved the books elsewhere. Then Don reattached the cubbyhole part on top of the bench part, making a single unit. Meanwhile the girls and I set out to find a Christmas tree. It was a foggy, misty day. The woods were definitely in a spooky mood. This enormous tamarack came down in a storm awhile ago. Eventually we'll harvest it for firewood. ...the girls decided Candidate No. 1 was the best choice, and we all headed back up to the house to fetch Don. With bow saw and nippers in hand, we reviewed Candidate No. 1 again to confirm our choice. The consensus was YES. It was a funny little tree with a thin bare truck up to about six feet, then a bushy symmetrical top. Don warned it would grow taller once it was cut (don't cut trees always become taller once they're on the ground? ), but he began sawing nonetheless. Here Older Daughter applies pressure so the trunk doesn't pinch the saw. Once on the ground, the girls know the routine. Pull! Sure enough, the tree had grown by several feet the moment it hit the ground. Such is life. Through the gate and into the driveway. ...I set up the tree stand. Turned out to be a lovely selection, and just the right height. As evening fell, we got the lights on. Don nipped the top by a few inches, and installed the angel. Then we put on Christmas music and started decorating. GG helped hang some of the many ornaments we've collected over the years. 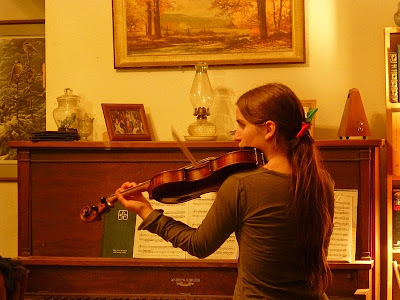 Younger Daughter grabbed her violin and played with some of the music. Lydia always enjoys the tree. She thinks we're weird for hauling a large specimen of vegetation indoors, but she doesn't seem to mind. This is my beloved nativity set my parents gave me just after I graduated from college. One of the nicest gifts I've ever received. Altogether it's a beautiful tree. We may break down and purchase an artificial tree for next year (live indoor trees exacerbate Don's allergies), but for now we're grateful for such a thing of beauty. Merry Christmas, Lewis Family and GiGi. That's a fine tree and I really enjoyed 'going with you' to get it. It's easy to see why you treasure that little nativity set. It's a very nice one. Gonna be Christmas in a minute! It's coming fast. If you are considering an artificial tree for next year check out the thrift stores. They have some right after Christmas and many next November! It's a lovely tree Patrice and extra special because you worked together to find it cut it and decorate it whilst listening to lovely music. Something very special about that. Over here on the other side of the world, we too will have a tree. Sadly we haven't got any woods to search one out but we buy our tree from the local Rotary Group and the proceeds go to charity. More than likely our Christmas Day will be hot so I'm thinking seafood might be on our menu this year. We have the same Nativity set, but it was handed down to us with several of the figures missing, so I appreciate seeing what the whole set looks like. We are not putting up a tree this year. Maybe not next year, either. Circumstances prevail. We will, however, have the nativity set on display.